Manning and Brady played each other seventeen times. Brady led the head-to-head series 11–6. From 2001–2015, the two quarterbacks met at least once every season, with the following exceptions: the Colts and Patriots, longtime AFC East division rivals from 1970–2001, did not meet in 2002 following the NFL's divisional re-alignment; Brady suffered a season-ending knee injury in Week 1 of the 2008 season; Manning missed the entire 2011 season due to recovery from multiple neck surgeries, as well as the 2015 regular-season meeting due to recovery from a torn plantar fascia. Brady led the Colts–Patriots series 8–4 and also led the Broncos–Patriots series 3–2, though Manning's two wins with the Broncos both occurred in the AFC Championships in 2013 and 2015. Brady led the series in Foxborough 8–2 (7–2 at Gillette Stadium), while Manning led the series in Indianapolis/Denver 4–3. The home team won each of the final seven games, with the last road win for either quarterback in the rivalry coming in Brady's 2007 win at Indianapolis. 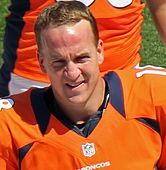 The two quarterbacks met five times in the NFL Playoffs, in which Manning led the playoff series 3–2. Each of the five games was won by the home team. Brady led 2–1 vs. Manning's Colts' teams, while Manning's Broncos' teams led 2–0. Four of the five matchups were in the AFC Championship Game, with Manning winning three out of four, one with the Colts and two with the Broncos. The winner of the playoff games went on to be the eventual Super Bowl winner, with the exception of the 2014 matchup. Note: Brady's statistics are updated as of February 3, 2019, while Manning's statistics are final. ^ Armour, Nancy (January 17, 2014). "With other QB rivalries 'not even close,' Manning and Brady square off again". USA Today. Archived from the original on January 1, 2016. Retrieved January 18, 2014. ^ Hochman, Benjamin (January 19, 2014). "Peyton Manning-Tom Brady ranks among greatest sports rivalries of all time". The Denver Post. Archived from the original on January 20, 2014. Retrieved January 20, 2014. ^ Reineking, Jim (January 21, 2016). "Top Tom Brady vs. Peyton Manning games". National Football League. Archived from the original on February 4, 2017. Retrieved February 4, 2017. ^ "Full Draft - 2000". Archived from the original on September 6, 2011. Retrieved December 23, 2014. ^ Springer, Shira (September 11, 2008). "Brady has both ACL and MCL tears". The Boston Globe. Archived from the original on February 20, 2016. Retrieved February 4, 2017. ^ Kelley, Craig (September 7, 2011). "COLLINS TO START". Indianapolis Colts. Archived from the original on February 4, 2017. Retrieved February 4, 2017. ^ Perry, Phil (November 9, 2017). "Miller can't stop calling Brady 'the GOAT' even though he thinks Manning was better". NBC Sports. Archived from the original on October 31, 2018. Retrieved October 30, 2018. ^ "Football's Greatest: Ranking the Top 10 Quarterbacks in NFL History". Sports Illustrated. October 27, 2017. Archived from the original on October 31, 2018. Retrieved October 30, 2018. ^ Battista, Judy (October 31, 2014). "Peyton Manning vs. Tom Brady: One for the ages -- and ageless". National Football League. Archived from the original on April 22, 2017. Retrieved February 4, 2017. ^ Donaldson, Jim (January 12, 2014). "Jim Donaldson: Brady-Manning – As good as it gets". Providence Journal. Archived from the original on March 3, 2016. Retrieved February 4, 2017. ^ a b c d e f g h i j k l m n o p q Bender, Bill (October 30, 2014). "By the Numbers: Tom Brady vs. Peyton Manning". The Sporting News. Archived from the original on October 1, 2015. Retrieved February 4, 2017. ^ Watanabe, Ben (November 2, 2014). "Peyton Manning Admits 'I Stunk' After Tom Brady Claims Rivalry Victory". New England Sports Network. Archived from the original on February 4, 2017. Retrieved February 4, 2017. ^ a b "Peyton Manning Stats | Pro-Football-Reference.com". Pro-Football-Reference.com. Archived from the original on October 2, 2018. Retrieved February 11, 2018. ^ a b "Tom Brady Stats | Pro-Football-Reference.com". Pro-Football-Reference.com. Archived from the original on February 6, 2018. Retrieved February 11, 2018.